Tag Archive | "Crossband Chocolate Gourami (Sphaerichthys selatanensis)"
Crossband Chocolate Gourami (Sphaerichthys selatanensis) also known as the Cherry Chocolate Gourami, are found close to the the city of Banjarmasin in South Kalimantan, Borneo, Indonesia. They appear to be well distributed in southern Borneo and have also been collected close to the settlement of Sampit, which is several hundred kilometers east in Central Kalimantan province. 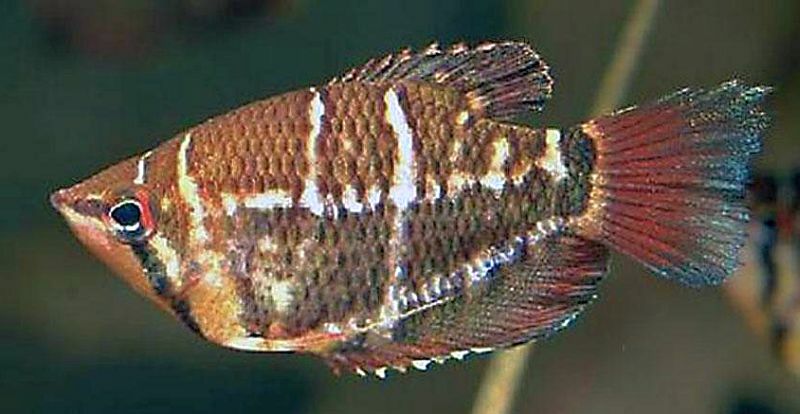 Similarly patterned Crossband Chocolate Gourami have been recorded on Belitung Island, Bangka Belitung Islands province, Indonesia which lies just off the eastern coast of Sumatra. These specimens have a more reddish color than the Borneo forms and are the first ever, other than Sphaerichthys osphromenoides, recorded outside of Borneo. Like other Anabantoidei, Crossband Chocolate Gourami possess a labyrinth organ that allows them to breathe atmospheric air to survive in oxygen deficient conditions that would kill many other species. Crossband Chocolate Gourami are found in blackwater peat swamps, the adjacent streams of their range, and sometimes in clear water areas that are tannin stained a dark brown color by the decomposition of leaves, brush, and other organic materials. The humic acids and other chemicals released by decomposition is beneficial to the fish and causes the water to turn a dark brown color. This decomposition also causes the pH of the water to drop into the 3.0 or 4.0 range and results in a negligible dissolved mineral content (very soft water). Because their normal habitat is in very slow moving waters littered with fallen tree branches, brush, and rotting leaves and under the dense jungle rain forest canopy where very little light is present, the fish should never be housed in a brightly lit tank or a tank with a strong current. The clearer water habitats where Crossband Chocolate Gourami are sometimes found are similar in terms of water chemistry, but in most cases cause profuse growths of aquatic vegetation. Lymnophila, Utricularia, Cryptocoryne, Blyxa, Barclaya, and Eleocharis are representative genera of these areas and can be used in a low light aquarium environment. Like Chocolate Gourami (Sphaerichthys osphromenoides), male Crossband Chocolate Gourami (Sphaerichthys selatanensis) are colored brown with white vertical stripes, however, Sphaerichthys selatanensis have an additional light, vertically orientated bar on each flank originating just ahead of the dorsal fin and terminating just after the ventral fins. In Sphaerichthys osphronemoides, this extra bar is absent or reduced to a small spot just behind the dorsal fin. Females are generally more colorful than the males and adult males have a uniformly straight lower jaw profile and a more acuminate head shape than females. Samurai Gourami (Sphaerichthys vaillanti) and Giant Chocolate Gourami (Sphaerichthys acrostoma) can be distinguished by their more elongate head and body profile, their reverse sexual dimorphism (females are more colorful), and the fact that they are paternal mouth brooders. 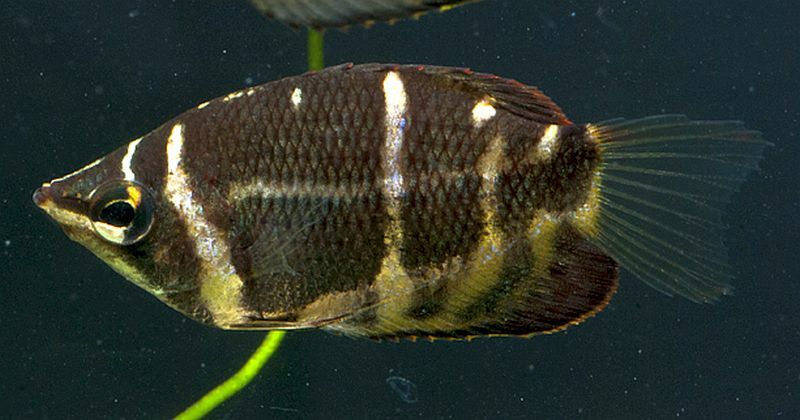 Crossband Chocolate Gourami are a shy, timid, and very slow moving species that should be housed in a biotope system with at least 6 to 8 of their own kind. In the tannin stained jungle streams where they are found, they have been collected along with Betta foerschi, Deissner’s Liquorice Gourami (Parosphromenus parvulus), HalfBeaks (Hemirhamphodon chrysopunctatus), Pectenocypris korthausae, Foersch’s Fire Barb (Puntius foerschi), and Borneo bonylipped barb (Osteochilus pentalineatus). Crossband Chocolate Gourami should be housed in a densely planted 20 gallon or larger aquarium, with a sandy or fine gravel substrate covered with dried leaf litter, lots of driftwood roots, wood bark, and branches formed into small caves for hiding places. Oak, Beach, or Ketapang Indian Almond Leaves should be placed on the bottom of the tank to replicate the blackwater conditions these fish are found in, and to keep the pH in the water low. As the leaves decompose in the tank, the microbe colonies that result provide a secondary food source for the fish and fry. The tannins and chemicals released into the water are known to be medicinal, and will prevent fungal infections. The leaves can either be removed and replaced every few weeks or so, or left in the tank to fully decompose. Some tropical fish keeping enthusiasts place lengths of PVC plastic pipe or ceramic flowerpots into the tank for hiding places, but aesthetically, bogwood or driftwood roots are preferred. Use low light loving plants like Microsorum, Taxiphyllum, Cryptocoryne, and Anubias to decorate and create hiding places for the fish. To keep Crossband Chocolate Gourami healthy, diffused lighting, soft water, and a low pH level is critical. This species lives in still, or very slow moving streams under the jungle canopy where very little light penetrates the water column. Some floating plants in the aquarium do diffuse the light and very little current in the tank will mimic these conditions. Avoid making large water changes that drastically change the chemistry of the aquarium. Performing a 10 to 15% water change every week, or every other week is more than adequate. This species should only be kept in an aged aquarium. Crossband Chocolate Gourami are maternal mouth brooders where the female broods the eggs. This is unique in that the only other anabantoid species where the female broods the eggs is the Chocolate Gourami (Sphaerichthys osphromenoides osphromenoides). Sphaerichthys selatanensis can be bred in a group or as a single pair, as long as the water quality and their conditioning diet is properly maintained. Use a separate breeding tank with Peat blackwater extract and maintain the pH level at pH 6.2. Lowering the water level and slowly raising the water temperature in the tank over a two by 2°, and then slowly adding some cooler water to the tank will usually initiate breeding activity. The male will usually initiate courtship which can be recognized when the male turns a dark, almost gray pattern. The colors in the female will intensify to a deep chocolate brown, with the light white vertical bars turning into an almost gold color. The pair remains upright during the spawning, which may take several hours to accomplish. When the eggs are laid and fertilized on the substrate, the female then collects them into her mouth. The eggs are unique in that they are pear shaped and have a series of spiraling ridges on their outer surface. Both parents will guard their territory until spawning is completed. After the eggs are gathered by the female, she will find a quiet area in the tank where she will remain until the eggs hatch and the fry are fully formed. This usually takes from 7 to 20 days, during which time the female does not eat. After the fry are fully formed, the female will release anywhere from 10 to 40 free swimming fry from her mouth. At this point the parents should be removed from the breeding tank and a tight fitting cover should be placed over the tank to create the humid air conditions required for the proper development of the labyrinth organ of the fry. The fry are large enough to immediately accept microworms or freshly hatched baby brine shrimp. During the rearing process, about 10% of the water in the tank should be changed daily to promote growth and maintain water quality. , or bloodworms. They may accept freeze dried bloodworms and even a quality carnivore flake food if the fish have been captive bred, but this species is difficult to feed, so be prepared to stock up on live and frozen foods if you intend to keep them. 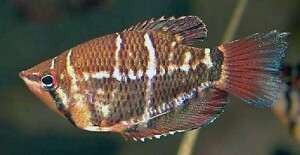 Crossband Chocolate Gourami are only occasionally available to tropical fish keeping enthusiasts and are often sold as Cherry Chocolate Gourami.